The French Revolution! The only part of history class you didn't sleep through, thanks to the drama, intrigue and of course, Reign of Terror. 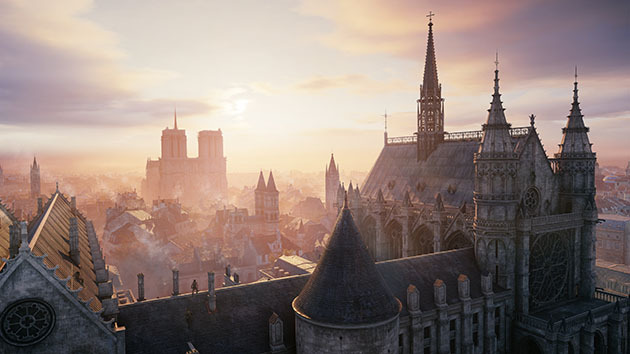 Paris circa 1790 is undoubtedly the star of Unity, Ubisoft's next Assassin's Creed chapter. Sure, the game looks damn nice and brings new gameplay elements like four-player "Brotherhood" co-op missions, murder mysteries, heists and so on. 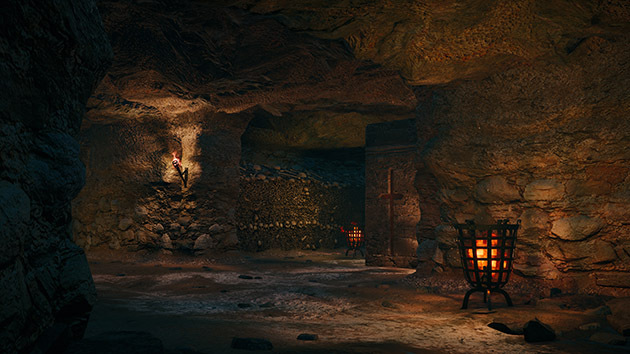 But Ubisoft did extensive research on the period to bring historically accurate details of iconic spots like the catacombs, Notre Dame Cathedral and even the Bastille, which was destroyed over 300 years ago. To show how far it went, the French game company gave us an inside look on the art direction, level design and more, topping it off with a tour of the centerpiece -- Paris. To see if it succeeded, read on. Unlike past Assassin's Creed (AC) chapters, Ubisoft told me that it aimed for real-world scale to enhance detail in the core section of the game. About a quarter of the buildings are playable, with about a fifth of those containing mission content. In other words, there's a lot of space to just wander around revolutionary Paris and skip busywork mission tasks, if that's your thing. Given the open-world ambitions, Unity's designers made its version of Paris a compelling place to hang out. They aimed for historically accurate housing styles, interiors designs, textures and atmospheric elements like smoke and mist. At the same time, the team didn't want to get bogged down in minutiae and took artistic license when needed to add drama and style. Another new aspect of the game is seamless interior transitions. Rather than an awkward loading "ellipse" between indoor, underground and outdoor scenes, Unity players will be able to directly enter and exit buildings with little to no break in play. The idea is to encourage exploration while making missions move along briskly. In addition, you can look into and out of windows for another dose of realism. 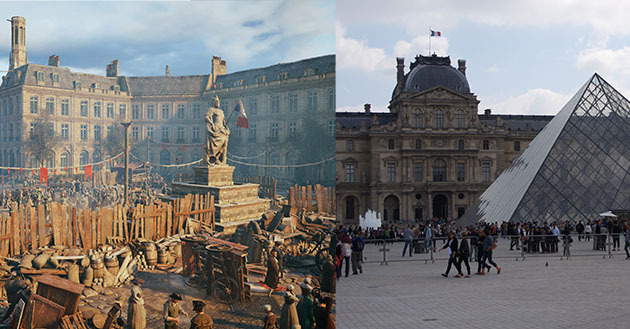 During the Paris tour, Ubisoft stopped and compared gameplay video on a tablet to real life monuments. Many of the 3D landmarks are dramatically similar to the real deal, with the added touch of grit and atmosphere from 1790s Paris. For instance, Notre Dame (top image) is a drop-dead match to its real life doppleganger. But Ubisoft's historians learned that the Cathedral was used for stocking arms and livestock during the revolution -- so the interior is loaded with weaponry and cows. History buffs might also appreciate Unity's take on the Bastille, the building that sparked the revolution when it was destroyed by an angry crowd in 1789. All that's left now are a few bricks at the Bastille metro and a monument at Place de la Bastille (above, right). However, the designers took advantage of numerous plans on the historical record to generate a highly believable version of the ominous, hulking fortress (at left). Other highlights include the Louvre, Hotel de Ville (city hall), le Marais district and Place de la Concorde -- the spot where King Louis XVI was guillotined. All those sites look like the were faithfully executed, which begs the question: what if you don't even want to bother with the gameplay? We could see folks whiling hours away just ducking into all the buildings or taking a tour of one of the three different underground levels. It might be a nice break from the violence, anyway -- and art direction aside, the game looks like it has the bloodshed part part of the revolution, in spades. For (many) more pics, check out the gallery above, or the Unity gameplay video below.